This album took me a little bit by surprise. I'm not really familiar with this band or it's history, but when I heard the opening track of this album in a record store, I decided to pick it up. Although the description of death/doom with occasional gothic overtones may sound rather cliched at this point, Godgory is actually quite original and unique. The first track, "Resurrection" is probably the best, and really hit me over the head with it's brilliance. Excellent death vocals, cool acoustic guitars, spoken word passages and a (synthesized?) brass section introduces the Godgory formula, and I settled in for the long haul. When the next song, "Crimson Snow" came on, I literally jumped out of my seat. Instead of the rather doomy sound that I was expecting, the track throttles the listener with a fairly brutal, melodic death metal approach. 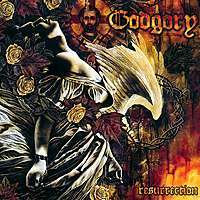 The contrast from the first to the second track is striking, and Godgory manages balance the brutality with the melancholy admirably for the rest of the album. "My Dead Dreams", the fourth song, is a midtempo blast that goes from a pure death metal verse to a keyboard laden, melodic chorus. This is probably the best song after the title track. The latter half of the album can get a little tedious because the band tends to rely on the succesful formula of the first song. "Waiting For Lunacy To Find Me" is really the song I'm pointing at here, sounding almost exactly like "Resurrection" in the verse, and then like "Adultery" in the chorus. The spoken word parts, especially, get rather boring by the end of the CD. That's really my only complaint though, and overall I'm very glad that I took a chance on this album. The music can very moody in one song, only to shift to a total bombast in another. Very cool approach.